Wednesday marked the second anniversary of Ukraine's snap presidential elections, where oligarch and politician Petro Poroshenko emerged victorious. Two years on, Russian news weekly Argumenti i Fakti recalled the president's pre-election promises, and how many of them have actually come to pass. On May 25, 2014, Poroshenko, a former minister under President Viktor Yanukovych, who was ousted in a coup d'état in February, 2014, won the snap presidential election, and was inaugurated into office two weeks later on June 7, 2014. 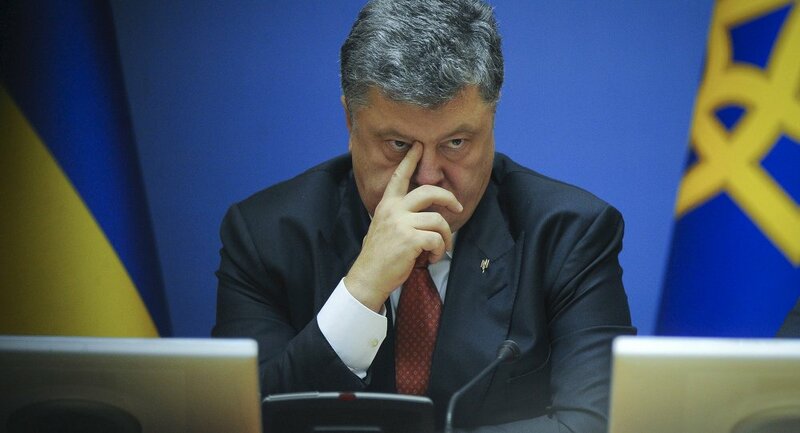 "How will Poroshenko go down in history? Which election promises did he fulfill, and which did he have no intention of fulfilling? What do ordinary Ukrainians think about the president who replaced Yanukovych?" These were questions Russian news and analysis weekly Argumenti I Fakti columnist Ekaterina Mirnaya attempted to answer in an analysis dedicated to the somber anniversary. 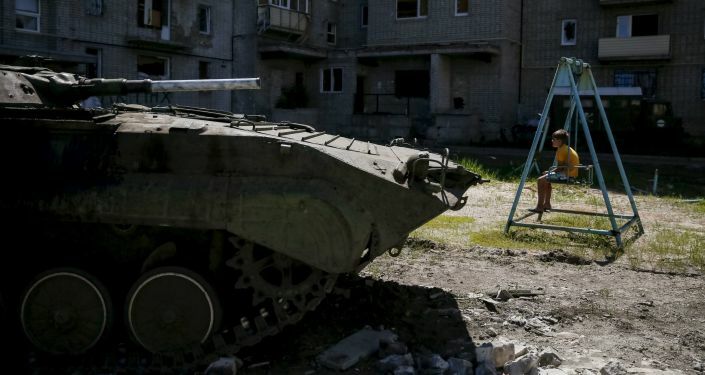 The journalist started out by recalling that during his presidential campaign, Poroshenko had promised to end the crisis in eastern Ukraine in a matter of hours. "However, he did not specify how he intended to deal with a rebellious Donbass, which had refused to accept the outcome of the coup in Kiev. In this way he gained the support of both voters supporting peaceful coexistence with Donetsk and Lugansk, and those who supported war." 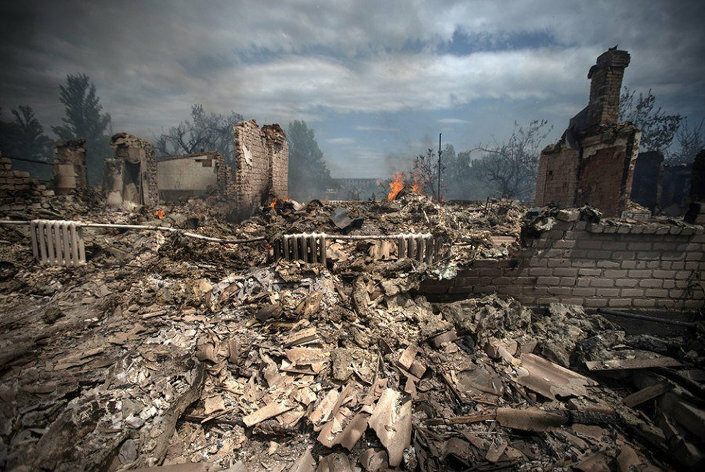 On June 1, 2014, President Poroshenko chose war, which continues to smolder to this day. "This decision led not only to tens of thousands of victims, but to Kiev's factual loss of control over half of the Donbass region." "Today," Mirnaya recalled, "Petro Poroshenko again faces a difficult choice: to refuse to comply with the political components of the Minsk agreements (elections in the Donbass, special status, amnesty and changes to the Ukrainian constitution) in favor of radicals, or to compromise with the Donetsk and Lugansk People's Republics and fulfill Kiev's obligations and to somehow build a state where the descendents of the veterans of the Great Patriotic War and those of the UPA [fascist collaborators] can somehow coexist." Unfortunately, "judging by the policy of the last two years, it's unlikely that Poroshenko will choose the second, peaceful option." Two years ago, during the election campaign, Poroshenko was quoted as saying that "the anti-terrorist operation [in the Donbass] cannot and will not last for 2-3 months. It must and will last for hours…In the near future we will see the effectiveness of the anti-terrorist operation." Since then, the so-called 'anti-terrorist operation' has turned into a deadly full-scale civil war in the country's southeast, with regional and global implications. In May 2015, shortly after the one-year anniversary of his presidency, Poroshenko shifted strategies, assuring Ukrainians that Kiev would "regain Crimea and the Donbass. The Donbass faster, Crimea a little later. But we will regain them when we are successful – when Ukrainians travel abroad without visas, when wages in Ukraine are double what they are in Crimea, when Ukrainians are employed and Crimeans are not." Two years later, Ukrainians are still waiting for visa-free travel to the EU, wages in Crimea are significantly higher than they are in Ukraine ($367, compared with $196, according to the Ukrainian Ministry of Finance), and unemployment too is significantly lower (0.8% in Crimea, compared to 9.9% in Ukraine, as of January 2016). "Today," Mirnaya writes, "some experts have credited Poroshenko for the relative stabilization of the national currency. Indeed, over the past six months rates have fluctuated in the region of 22-27.5 hryvnia to one US dollar. But when Poroshenko took office, the rate was 12 hryvnia per USD." "At the same time, the new Ukrainian government proudly talks about eliminating the country's energy dependence on Russia, saying that Ukraine has not purchased Russian gas since the start of 2016. Indeed, why would a country that has faced such a tremendous decline in its industrial output need so much Russian gas? Indeed, some economists are comparing the present collapse of Ukrainian industrial output to the losses faced by the Soviet Union during the Second World War." Worse yet, energy experts have repeatedly pointed out that the gas Ukraine buys from Slovakia is actually Russian gas reclassified 'non-Russian' and pumped back into Ukraine at a profit for European energy companies. Meanwhile, residents of rural areas have complained that they have had to stop using gas altogether in favor of traditional wood stoves, saying they simply cannot afford the new utility rates. Meanwhile, Mirnaya continued, "Ukrainian companies continuing to die off from the loss of the Russian market. Thanks to the factual termination of economic relations between the two countries, these losses have also been compounded by the loss of transit for Ukrainian goods heading to the Caucasus and Central Asia through Russian territory." As far as Western markets are concerned, formally, Ukraine has been granted access to European markets with the signing of a free trade agreement earlier this year. "In truth, even the most ardent supporters of the Maidan among businessmen have had to admit that the European market cannot compensate for the loss of the Russian one. Moreover, the obligations imposed on Ukraine by Brussels (a ban on export restrictions for raw materials required by Ukrainian industries, and requirements on a transition to EU standards) have proven too heavy a burden." "Ordinary Ukrainians," Mirnaya recalled, "suffer together with businesses, facing a freeze on salaries and a sharp increase in utilities prices and unemployment; this is the policy imposed on the government by the IMF." And this in spite of Candidate Poroshenko's promises to turn Ukraine into a thriving economy with high wages and a European standard of living. With ordinary Ukrainians finding Poroshenko's election promises out of whack with his actual policies (something confirmed by his falling approval ratings, from the 64% approval in May 2014, to 10% approval in May 2016), Ukraine's foreign partners in Brussels and Washington have also grown increasingly frustrated and disillusioned. "The IMF periodically throws Kiev some money, but less and less and under increasingly harsh conditions," the Mirnaya noted. "The Maidan victors' honeymoon with Europe and the United States ended a long time ago," the journalist added. "After the coup, the West wanted one thing from Poroshenko and co.: for them to follow directives from Washington, Brussels and Berlin. But Ukraine's elite decided to play its own game. This was evident in the winter of 2015, after the signing of the Minsk-2 agreement. Poroshenko signed the agreement hoping to stall for time, as he had after Minsk I. But this time he was irritating not arch-enemy Russia, but Angela Merkel, with Minsk-2 being her initiative, and its implementation a matter of her image." Foreign ministers of Russia, Ukraine, France and Germany meeting to discuss the ongoing crisis in Ukraine. At the same time, Mirnaya recalled, "the West failed to appreciate the national tradition that had formed in Ukraine over a period of 20 years, where the tastiest morsels of the economy were divided up between the country's oligarchs." And this includes the Ukrainian president himself. Earlier this year, the Panama Papers had confirmed that Poroshenko has yet to hand over the shares to his Roshen confectionary empire into a trust, despite repeated election promises to do so. Moreover, Poroshenko signed the documents on creating an offshore for the company the same day that that the Ukrainian army got caught in an encirclement by Donbass militia in the town of Ilovaisk, considered a massacre and a national tragedy in Ukraine. The dreadful state of affairs in the country was confirmed in March of this year, when Forbes Ukraine calculated that Poroshenko had increased his personal wealth by $100 million in 2015 to $858 million, making him the sixth-richest businessman in the country. Ultimately, Mirnaya recalled, "public frustration is growing. Radicals consider Poroshenko a traitor due to the Minsk Agreements. Meanwhile, the peaceful fanatics of the 'European choice' wince in disgust at the constant string of corruption scandals in the president's entourage, crowned by the Panama offshore revelations. For those who came out to the Euromaidan protests in its first days, it's becoming less and less clear how Poroshenko's regime is any different from that of Yanukovych." 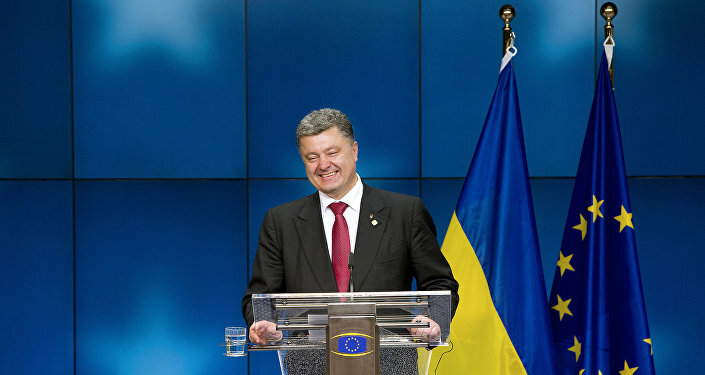 Poroshenko's 'living in a new way', election slogan, the journalist noted, "brings forth only an ironic smile today. Poroshenko-ally Volodymyr Groisman has become prime minister…Yuri Lutsenko, another Poroshenko compadre, was not simply given the post of public prosecutor – the parliament had to pass a special law allowing the post to be occupied by a person without legal training. This, apparently, is how Poroshenko 'gets rid' of nepotism in the government." Ultimately, Mirnaya wrote, "to try and smooth out the negative effects from his unfulfilled promises, the president gave the go-ahead for a battle with monuments, and with the Great Patriotic War, with the 'communist street and city names' and with Russian films." But this, it seems, hasn't worked. Therefore, with his main 'accomplishments' being the ongoing war in eastern Ukraine, a collapsed economy and uncontrollable ultranationalists, it's only logical that his approval rating has fallen from well over 50% to near single digits.